Telopea speciosissima or the “waratah” is a native Australian plant with spectacular flowers. Robert Brown (1773-1858) named the genus Telopea in 1810 from specimens collected in the Blue Mountains, west of Sydney. Sir James Smith (1759-1828), a noted botanist and founder of the Linnaean Society in England, wrote in 1793: 'The most magnificent plant which the prolific soil of New Holland affords is, by common consent, both of Europeans and Natives, the Waratah. It is moreover a favourite with the latter, upon account of a rich honeyed juice which they sip from its flowers'. The generic name Telopea is derived from the Greek 'telopos', meaning 'seen from afar', and refers to the great distance from which the crimson flowers are discernible. The specific name speciosissima is the superlative of the Latin adjective 'speciosus', meaning 'beautiful' or 'handsome'. 'Waratah', the Aboriginal name for the species, was adopted by early settlers at Port Jackson. Telopea is an eastern Australian genus of four species. Two are confined to New South Wales, one to Tasmania and one extends from eastern Victoria into New South Wales. Telopea belongs to the family, Proteaceae, which is predominantly Australian and southern African. 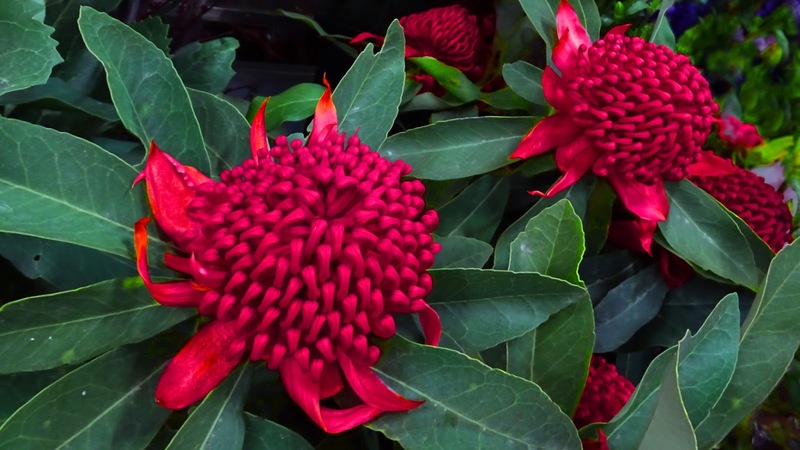 The Waratah is a stout, erect shrub which may grow to 4 metres. The dark green leathery leaves, 13-25 cm in length, are arranged alternately and tend to be coarsely toothed. The flowers are grouped in rounded heads 7 to 10 cm in diameter surrounded by crimson bracts, about 5 to 7 cm long. It flowers from September to November and nectar-seeking birds act as pollinators. Large winged seeds are released when the brown leathery pods split along one side. The species is fairly widespread on the central coast and adjoining mountains of New South Wales, occurring from the Gibraltar Range, north of Sydney, to Conjola in the south. It grows mainly in the shrub understorey in open forest developed on sandstone and adjoining volcanic formations, from sea level to above 1000 metres in the Blue Mountains. Soils within its range tend to be sandy and low in plant nutrients. Rainfall is moderately high. Waratah plants resist destruction by bushfires, a natural element of their habitat, by regenerating from the rootstock. Flowering recommences two years after a moderate fire. The Waratah is a spectacular garden subject in suitable soil and climate; it flowers prolifically and tends to be long-lived. The Waratah occurs naturally in at least ten national parks in the geological formation, know as the Sydney Basin. Brisbane Water, Dharug and Macquarie Pass National Parks are among the areas where this species is conserved. Waratahs are cultivated north of Sydney and in the Dandenong Ranges, Victoria. They are grown in Israel, New Zealand and Hawaii for the cut flower trade. It was introduced to England in 1789 but cannot survive English winters out of doors except in the south-west coastal regions, and it rarely flowers in glasshouses. It is also cultivated in California. Hi! These flowers are very beautiful. Thanks for sharing. Nick, what spectacular flowers, indeed. Thanks for sharing.